Using 3 in 1 and painting the vertical fin yellow-orange, or RAL 2000 to be more specific. 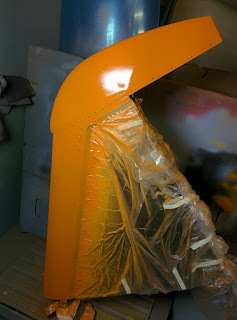 The whole plane will be a mix of polished alu, orange and grey. The Power Coat 3 in 1 is an industrial paint based on modified polyester. I have used it for several things, and it is equally strong as the polyurethane I used in the cockpit. Really easy to use, and the surface is matt-ish. 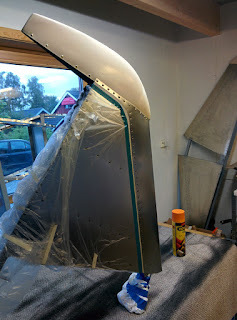 My name is Bjørnar Svingen, and i am building this Onex experimental aircraft. The main purpose of this blog is to log the progress. It may also be of interest to other builders. Here is a link to Sonex Aircraft, the designer of the aircraft and the producer of the kit. The Onex is unique. It is a single seater, powered by a VW engine, it's aerobatic and it has folding wings. What happened to my RV-4? it's put on hold for the time being. I have to have an airplane up and running, and a new Onex kit is a faster and cheaper way to achieve that even though the RV-4 is almost half way there. Due to the folding wings, I can actually see a way to place it on Værnes airfield as well, a thing I still cannot see happen with my RV-4, which is important for the motivation. All in all the Onex has charm like no other. It is also the quintessential homebuilt aircraft, even the engine has to be put together by the builder.